At its very essence, Blackjack is one of the simplest card games that you can play, yet the simple notion of beating your opponents cards by achieving 21 or less, belies the subtle complexities of the game which make it so attractive. Yet despite almost universal popularity across the globe, there are some frustrating aspects to the game, typically about the cards you (or your opponent) has been dealt and in Microgaming’s new offering, European Redeal Blackjack, you don’t have to put up with being dealt a poor hand against a strong hand for your opponent. This new addition to the Gold Series of Table Games still adheres to the time-honoured traditions of Blackjack, but with a new twist – if you don’t like the cards that you, or your opponent has been dealt then for a small cost, you can ‘redeal’ the cards. So for example, if your opponent is sat with an ace showing and your pocket cards add up to 15. You can “redeal” to try and improve the odds of you winning on this hand. Certain combinations of cards automatically trigger a redeal, meaning you don’t have to use up any of your five redeals if these particularly poor selections of cards are dealt to you. The game still features options such as to split and Double Down and both the dealer and player must stand when they reach 17. Part of the attraction of the new game is not just the redeal option. The graphics are smooth and beautifully realised, gameplay is fast and the ambient background music doesn’t interfere with the game, but merely adds to the experience. 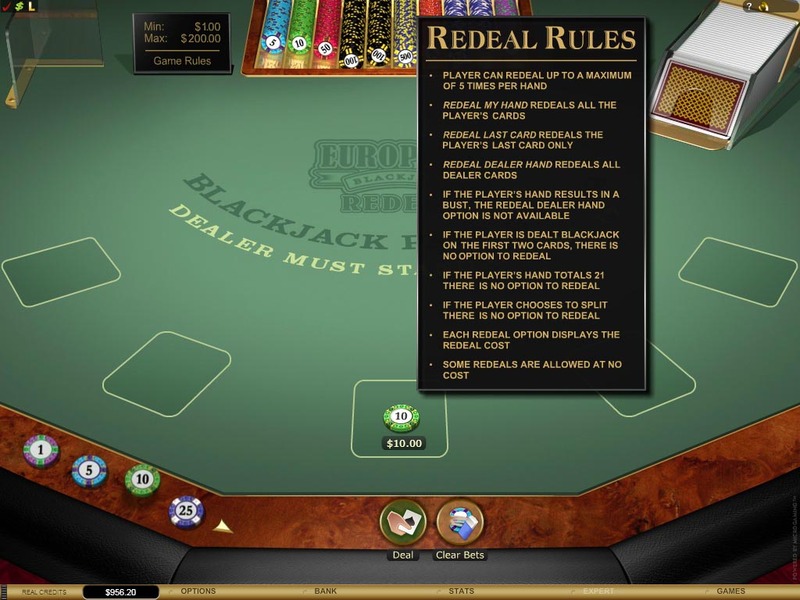 So if you are a fan of the game, give European Redeal Blackjack a try; it’s the real redeal!